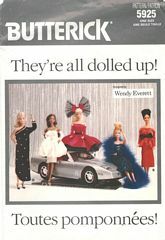 Vintage Butterick sewing pattern number 5925 entitled "They're all dolled up!" Patterns and instructions for eight outfits for 11-1/2 inch fashion dolls such as Barbie. Five outfits are shown on the envelope front. Additional outfits shown on the back are a coat, halter dress with hemline flounce and two piece formal dress.